Deb's Cup of Tea: 5 1/2 hours on the feet, but so worth it. I went to the Museum of Science and Industry today with my daughter, her boyfriend, David, and her friend from high school, Niles. I had not been in the museum since early in the morning in January 2009 when my company's structural engineers did a study in preparation for the redoing of the west exit. We were there before the museum opened and didn't really walk around. This place was originally built for the World Columbian Exposition, one of the few permanent structures. Daniel Burnham had the ultimate design concept for the fair and is credited with taking the swampy south side of Chicago and creating the lagoons that are still south of the museum. There was a very small exhibit of artifacts in the museum but I remember, when we were members, on the 100th anniversary of the building and the fair, a grand exhibit of the building and how it fell into disuse until rehabilitated. It has seen a number of additions and expansions. We were able to see about half of it in the 5.5 hours we were there. Carole and David took hundreds of photos. As I have only one memory card left, I am limited to 25. This is one of the side hallways. 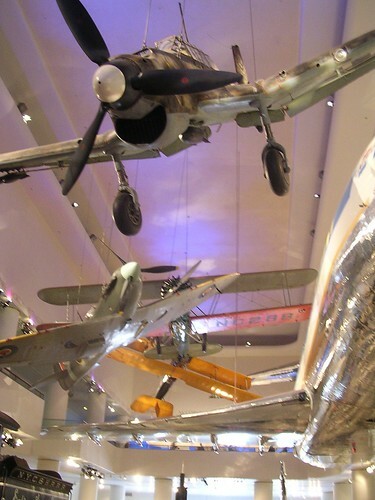 These planes, originals, hang above the model railroad. 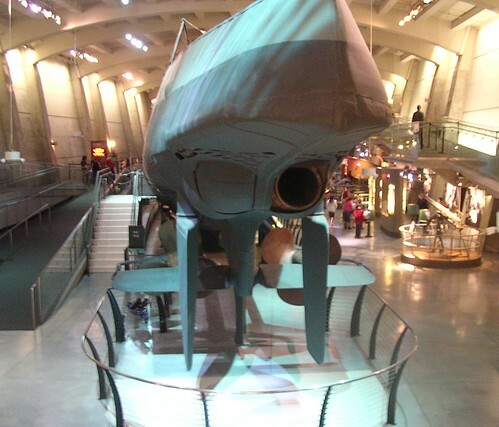 One of the highlights of the museum has been the preservation of the captured U-Boat, the U505. Briefly, in the week before the D-Day invasion, Chicago native, Captain Daniel Gallery, chanced upon the U-boat near the Canary Islands. In the span of 6 minutes, Captain Gallery and the ships and airplanes under his command disabled the sub. Men boarded the vessel and prevented it from sinking. It was then towed to Bermuda where it was searched and anything that could be learned was. The capture was kept completely secret until after the war and the sub went on a tour of east coast cities. It was decommissioned after the war and Captain Gallery convinced the Navy to give it to his hometown. It was towed through the St. Lawrence Seaway and into Lake Michigan, arriving at the shore across Lake Shore Drive from the museum. In September of 1954, it was moved across Lake Shore Drive and positioned on the east side of the museum. In 1971, my family made a trip to Chicago and I remember taking a tour of the sub. On the occasion of its 50th birthday, it was announced that the sub was in dire need of preservation. Chicago weather is not kind to outdoor artifacts. Without some sort of preservation effort, the sub would become unsafe for tours. 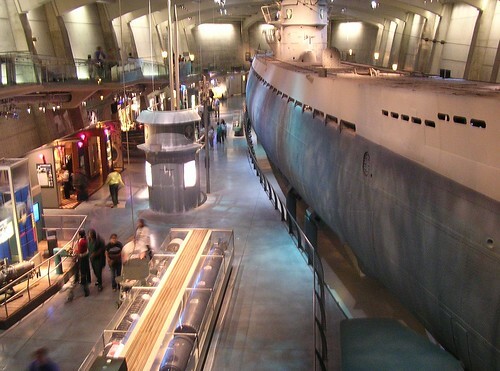 The museum launched its biggest preservation effort ever, to move the sub into a climate controlled area. My company provided vibration monitoring for the building of the room to house the sub. I was not on this project personally other than a few things at the beginning as I had several large projects in downtown Chicago to oversee. In April of 2004, the sub was moved from its east museum site to a north site where it was lowered into the ground. Luke, who had worked on the monitoring project, was invited to watch some of the moving of the sub so we drove down and watched the machinery creep along toward the room where the sub would rest. I had not been to the exhibit since it had opened. We did not have time to take the sub tour as we wanted to see the IMAX presentation on the Hubble Telescope. The exhibit is incredible. There is a lot to read and take in about the sub, the technology of the day and the capture itself. We were going to go to the Art Institute today, but that was scuttled in favor of spending at least an hour just walking around this area. This is an outstanding example of preservation. The one thing that struck me about the sub was how much the rear copies the outline of a whale. I know I have seen photos of whales with their flippers down as they glide through the water. While it does cost a fair penny to get into the museum, it's well worth the trip and the time.